Some long-term causes of World War II are found in the conditions preceding World War I and seen as common for both World Wars. Supporters of this view paraphrase Clausewitz: World War II was a continuation of World War I by the same means. 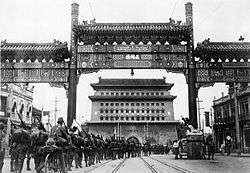 In fact, World Wars had been expected before Mussolini and Hitler came to power and Japan invaded China. Problems arose in Weimar Germany that experienced strong currents of revanchism after the Treaty of Versailles that concluded its defeat in World War I in 1918. 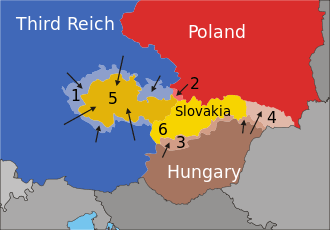 Dissatisfactions of treaty provisions included the demilitarization of the Rhineland, the prohibition of unification with Austria and the loss of German-speaking territories such as Danzig, Eupen-Malmedy and Upper Silesia despite Wilson's Fourteen Points, the limitations on the Reichswehr making it a token military force, the war-guilt clause, and last but not least the heavy tribute that Germany had to pay in the form of war reparations, which became an unbearable burden after the Great Depression. The most serious internal cause in Germany was the instability of the political system, as large sectors of politically active Germans rejected the legitimacy of the Weimar Republic. After his rise and take-over of power in 1933 to a large part based on these grievances, Adolf Hitler and the Nazis heavily promoted them and also ideas of vastly ambitious additional demands based on Nazi ideology such as uniting all Germans (and further all Germanic peoples) in Europe in a single nation; the acquisition of "living space" (Lebensraum) for primarily agrarian settlers (Blut und Boden), creating a "pull towards the East" (Drang nach Osten) where such territories were to be found and colonized, in a model that the Nazis explicitly derived from the American Manifest Destiny in the Far West and its clearing of native inhabitants; the elimination of Bolshevism; and the hegemony of an "Aryan"/"Nordic" so-called Master Race over the "sub-humans" (Untermenschen) of inferior races, chief among them Slavs and Jews. The internationalist-minded, radical Bolsheviks seized power in Russia in November 1917, with the goal of overthrowing capitalism across the world. They supported Communist parties in many lands and helped set up similar regimes in Hungary and Bavaria, Azerbaijan, Armenia and Georgia. This caused many Europeans to fear that a violent Communist revolution would overwhelm their own countries. The Red expansion was stopped outside Warsaw by the Polish army, and by 1920 there was a corridor of border states just west of Russia that rejected Communism. However, they feuded among themselves, and such alliances they formed, like the Little Entente, were unstable. Both Italian and German fascism were in part a reaction to international communist and socialist uprisings, in conjunction with nationalist fears of a Slavic empire. A further factor in Germany was the success of Freikorps (voluntary paramilitary groups of World War I veterans) in crushing the Bolshevik Bavarian Soviet Republic in Munich in 1919. Many of these veterans became early components of the Nazis' SA ("Stormtroopers"), which would be the party's troops in the street warfare with the Communist armed militia in the decade before 1933. The street violence would help shift moderate opinion towards the need for Germany to find an anti-Communist strongman to restore stability to German life. "No postwar German government believed it could accept such a burden on future generations and survive ...". Paying reparations is a classic punishment of war but in this instance it was the "extreme immoderation" (History) that caused German resentment. Germany made its last World War I reparation payment on 3 October 2010, ninety-two years after the end of World War I. Germany also fell behind in their coal payments. They fell behind because of a passive resistance movement against the French. In response, the French invaded the Ruhr, the region filled with German coal, and occupied it. At this point the majority of Germans were enraged with the French and placed the blame for their humiliation on the Weimar Republic. Adolf Hitler, a leader of the Nazi Party, attempted a coup d'état against the republic to establish a Greater German Reich known as the Beer Hall Putsch in 1923. Although this failed, Hitler gained recognition as a national hero amongst the German population. The demilitarized Rhineland and additional cutbacks on military infuriated the Germans. Although it is logical that France would want the Rhineland to be a neutral zone, the fact that France had the power to make that desire happen merely added onto the resentment of the Germans against the French. 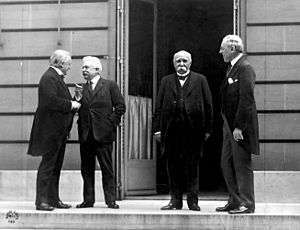 In addition, the Treaty of Versailles dissolved the German general staff and possession of navy ships, aircraft, poison gas, tanks, and heavy artillery was made illegal. The humiliation of being bossed around by the victor countries, especially France, and being stripped of their prized military made the Germans resent the Weimar Republic and idolize anyone who stood up to it. Mason had argued that the German working-class was always opposed to the Nazi dictatorship; that in the over-heated German economy of the late 1930s, German workers could force employers to grant higher wages by leaving for another firm that would grant the desired wage increases; that this was a form of political resistance and this resistance forced Adolf Hitler to go to war in 1939. Thus, the outbreak of the Second World War was caused by structural economic problems, a "flight into war" imposed by a domestic crisis. The key aspects of the crisis were according to Mason, a shaky economic recovery was threatened by a rearmament program that was overwhelming the economy and in which the Nazi regime's nationalist bluster limited its options. In this way, Mason articulated a Primat der Innenpolitik ("primacy of domestic politics") view of World War II's origins through the concept of social imperialism. Mason's Primat der Innenpolitik thesis was in marked contrast to the Primat der Außenpolitik ("primacy of foreign politics) usually used to explain World War II. In Mason's opinion, German foreign policy was driven by domestic political considerations, and the launch of World War II in 1939 was best understood as a "barbaric variant of social imperialism". Hitler's diplomatic strategy was to make seemingly reasonable demands, threatening war if they were not met. When opponents tried to appease him, he accepted the gains that were offered, then went to the next target. 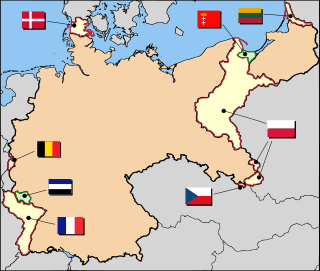 That aggressive strategy worked as Germany pulled out of the League of Nations (1933), rejected the Versailles Treaty and began to re-arm (1935) with the Anglo-German Naval Agreement, won back the Saar (1935), re-militarized the Rhineland (1936), formed an alliance ("axis") with Mussolini's Italy (1936), sent massive military aid to Franco in the Spanish Civil War (1936–39), seized Austria (1938), took over Czechoslovakia after the British and French appeasement of the Munich Agreement of 1938, formed a peace pact with Stalin's Russia in August 1939, and finally invaded Poland in September 1939. 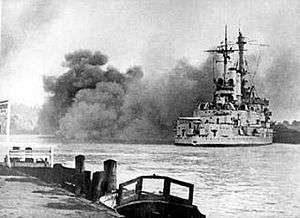 Germany attacked the Soviet Union in June 1941. Hitler believed that the Soviet Union could be defeated in a fast-paced and relentless assault that capitalized on the Soviet Union's ill-prepared state, and hoped that success there would bring Britain to the negotiation table, ending the war altogether. Hitler further wanted to preempt an attack by the Soviet Union, and in doing so catch the Soviets off-guard. ↑ Bauer, Yehuda. "Why Did World War II Break Out?". Yadvashem.org. Retrieved 16 January 2014. ↑ "World War 2 Causes". History Learning Site. Retrieved 6 March 2014. ↑ "the definition of militarism". Dictionary.com. Retrieved 2015-05-30. ↑ Bruno Coppieters; N. Fotion (2008). Moral Constraints on War: Principles and Cases. Lexington Books. p. 6. 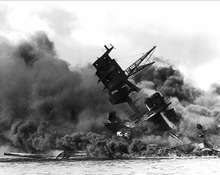 ↑ "Japanese history: Militarism and World War II". www.japan-guide.com. Retrieved 2015-05-30. ↑ "The National Archives Learning Curve | The Great War | Making peace | Reaction to the Treaty of Versailles | Background". www.nationalarchives.gov.uk. Retrieved 2015-05-30. ↑ Roy H. Ginsberg (2007). Demystifying the European Union: The Enduring Logic of Regional Integration. Rowman & Littlefield. p. 32. ↑ Winter, Jay (2009). The Legacy of the Great War: Ninety Years On. University of Missouri Press. p. 126. 1 2 Paxton, Robert O. (2011). Europe in the Twentieth Century. United States: Wadsworth. p. 145. 1 2 Paxton, Robert O. (2011). Europe in the Twentieth Century. United States: Wadsworth. p. 153. ↑ "History of World War I". Retrieved 15 November 2011. 1 2 Paxton, Robert O. (2011). Europe in the Twentieth Century. United States: Wadsworth. p. 151. ↑ Crossland, David. "Germany Set to Make Final World War I Reparation Payment". ABC News. Retrieved 16 November 2011. ↑ Paxton, Robert O. (2011). Europe in the Twentieth Century. United States: Wadsworth. p. 164. ↑ http://home.zonnet.nl/rene.brouwer/majorbattles.htm. "Beer Hall Putsch" Check |url= value (help). Holocaust Encyclopedia. Retrieved 16 November 2011. ↑ Goebbels, Joseph. "The New Year 1939/40". Retrieved 16 January 2014. ↑ "History of the League of Nations". Retrieved 16 January 2014. 1 2 Kershaw, Ian The Nazi Dictatorship London : Arnold 2000 page 88. ↑ Jeffrey Record (2007). 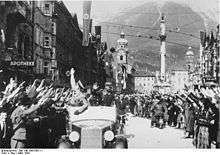 The Specter of Munich: Reconsidering the Lessons of Appeasing Hitler. Potomac Books, Inc. p. 106. ↑ Paul W. Doerr (1988). 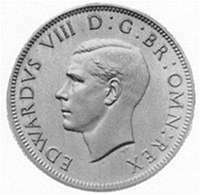 British Foreign Policy, 1919–1939. Manchester University Press. pp. 189–94. ↑ "Spanish Civil War (1936-1939) - History of Spain | don Quijote". donQuijote. Retrieved 2015-05-30. ↑ Stanley G. Payne (2008). 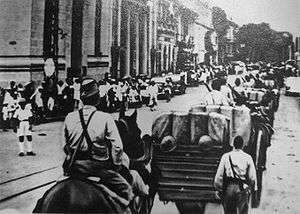 The Spanish Civil War, the Soviet Union, and Communism. Yale UP. pp. 313–14. ↑ A history of the world from the 20th ... - Google Books. Books.google.com. ISBN 978-0-415-28955-9. Retrieved 2009-06-16. ↑ "Bericht über eine Besprechung (Schmundt-Mitschrift)". ↑ Conrad Black (2005). Franklin Delano Roosevelt: Champion of Freedom. PublicAffairs. pp. 645–46. ↑ Howard W. French (December 9, 1999). 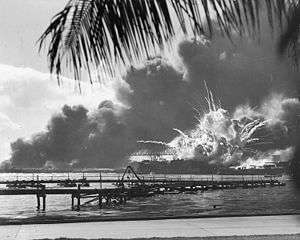 "Pearl Harbor Truly a Sneak Attack, Papers Show". The New York Times.